Monterosso is one of the five beautiful villages along the Italian Riviera’s Cinque Terre. If you’ve never visited here before, prepare to be entranced. If you have, then you’ve probably already dreamed of living here someday. This week, why not consider making those dreams a reality? Monterosso is actually officially a commune, and since it is under protection as a national park (along with the whole of Cinque Terre) and as a UNESCO World Heritage site, it isn’t exactly an easy place for expats to move to en masse. Even so, its well-preserved beauty is also part of what makes the town so alluring. The best way to move here is actually to find real estate in the surrounding La Spezia province, or perhaps even in Pisa (home of the leaning tower!). 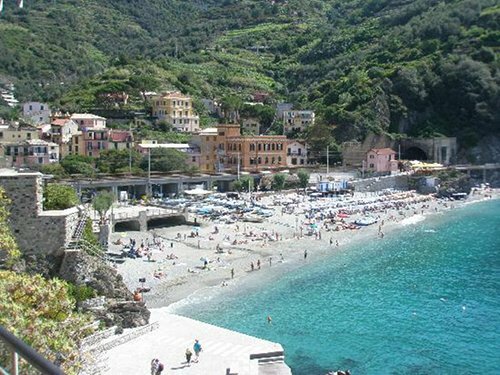 Getting in and out of Monterosso is exceptionally easy due to its convenient train station, and it’s a short ride from anywhere in the surrounding region. One of the perks of Monterosso compared to the rest of the Cinque Terre villages is its beach, which makes it a popular hub for sun bathers visiting the area since it is the only exclusive beach within the Cinque Terre. Of course, during tourist season in the summer, it can get overcrowded here. But for much of the year its historical atmosphere, environment and culture is relatively well preserved. If you’re one to take daily walks, then you simply can’t do better than the Cinque Terre. There is a hiking trail which famously connects Monterosso with the rest of the villages; one of the most breathtaking hikes in the world. Along the way, pick out some fresh lemonade or wine from farmers who call this hillside their home. Historically, many of the villages on the Mediterranean were walled to protect against attacks from the sea– which today has added an architectural beauty to Monterosso which is incredible. This area of the coast was often attacked by Muslim pirates and Vikings. Viking influence can still be seen in the occasional fair-skinned, red-headed children of the native villagers in the region. Of course, nowadays the only invaders are the waves of tourists. Italy has its fair share of beautiful tourist destinations, and the Cinque Terre might top them all. It will be impossible for you to visit here without wanting to stay forever. I absolutely adore the Cinque Terre. I was there last April and have been pining to get back since. The hike between the villages can’t be topped.